Earlier this year, I had the pleasure of attending the Center for an Urban Future’s “Scaling Up Small Businesses” panel; part of a series that was held across New York City’s five boroughs. The series featured a panel of small business professionals who discussed the potential for small business growth and entrepreneurs who shared some of the challenges they encountered as they worked to grow their businesses. The participants engaged in a much needed conversation regarding the role service providers should play in serving entrepreneurs to help them sustain small business growth. There are many public sector organizations that assist aspiring entrepreneurs with the early stages of setting up a small business. Some of these general support services include business plan development, financial advisement, access to educational workshops and trainings, or legal and technical assistance. Although these start-up services are vital in preparing entrepreneurs for the challenges associated with starting a small business, entrepreneurs also need access to specific services. For example, a report from the Center for an Urban Future revealed that the City’s abundant and complex workforce development system maintains very few connections with small businesses or organizations that serve as intermediaries for entrepreneurs. Workforce Connections described workforce development as an interconnected set of solutions to meet employment needs. Implementing workforce development strategies prepares workers with needed skills while addressing the hiring demands of employers. These initiatives include ongoing education, job training, skill development, and support services for employers to improve their workplace environment. Entrepreneurs, particularly those in the start-up stages, often lack the essential resources and information on available support services to apply basic workforce development practices. 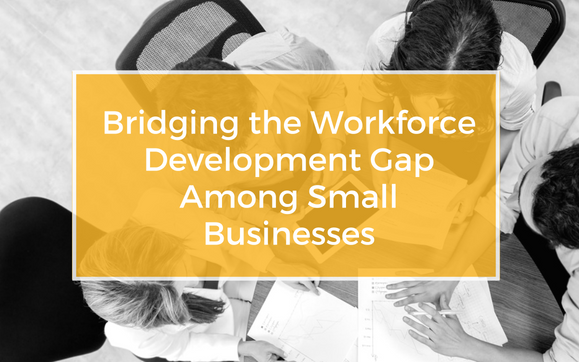 If public sector organizations, including city government entities and community-based organizations, collaborate to bridge the workforce development gap amongst small businesses, entrepreneurs may have a better chance at achieving success. The report mentioned earlier, includes recommendations to expand services provided through programs like Good Help. Good Help provides a variety of no-cost employment services and guidance to small local business owners. In an effort to address current employment needs, this organization assists entrepreneurs with attracting and recruiting skilled employees. Other recommendations include making small but impactful steps including increasing engagement between current small business service providers to raise awareness or share information on workforce development services that are available to entrepreneurs. There is no single solution to resolving the range of complex workforce development issues entrepreneurs face; however, combining the services that already exist can help fill some resource gaps that currently prevent many local owners from maintaining small business growth. The New York State Department of Labor’s Business Services offers a range of workforce development services for businesses including customized recruitment, access to job and career fairs, human resource consultations services, and training programs. Workforce1, run by the NYC Department of Small Business Services, prepares and connects qualified candidates to job opportunities in New York City. For more information on a Workforce1 center near you, please click here. Good Help is the no-cost employment service run by the Brooklyn Chamber of Commerce. Good Help assists businesses that have immediate needs for qualified, skilled employees by connecting them with pre-screened candidates.